I first stumbled over George Duke when I bought Back on the Block . On one of the tracks, ‘One man woman’, there was this amazing keyboard solo I couldn’t get enough of. You could tell this was an artist comfortable on a synth, a confident user of his slide control wheel and who would use his 30 seconds of glory on a track like this to the max. The fact that Siedah Garret did some outstanding vocal work and Herbie Hancock was there as well certainly helped, but it was Duke’s solo I really liked. So I did some research and was astounded that he was not only Zappa’s keyboarder and was playing with Jean Luc Ponty in Zappa’s houseband back in the early seventies, but that he was influenced by Cal Tjader, played with Cannonball Adderley and pretty much everybody in the American Soul and Jazz industry I got curious. 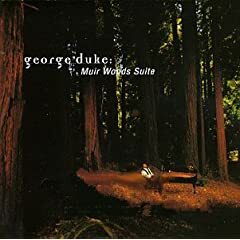 So I bought the Muir Woods Suite , Duke’s only orchestral work to date, performed live at Montreux Jazz Festival in 1996 (and, as far as I can tell, this is the only recording). Scored for orchestra and band, this features Duke on piano, Stanley Clarke on bass, Chester Thompson on Drums and Paulinho Dacosta on percussion. Stirling musicians for an extremely interesting piece of music. Somewhere between Gershwin and the German romantics of the late 19th century and hard bop, the 7 movements (or phases) are a well arranged interplay between the orchestra and Duke’s jazz fellows, with some sterling piano work and outstanding melodies. Much more than mood music or ‘smooth jazz’, this is an outstanding composition that begs to be performed again. I first heard George Duke’s performance of Muir Woods Suite on a sample DVD that came with a new Gateway computer I bought in 1997. I would watch and listen to this song over and over. It’s a beautiful and haunting melody that inspires, shifting, changing and building. For a long time I couldn’t find it because I lost the DVD. I only remembered that it was that it was performed live at the Montreaux Jazz Festival somtime in the 90’s. I kept searching and finally tracked it down and now that I have it again, I listen to it often and still get the same emotion – one of hope, love, and wonderment.